Once upon a time, there was Prince. He saw a girl, a commoner, and fell in love with her. Stars rose in the sky, and things were not the same any more. This is the story of Prince William and Catherine Middleton, who met in 2001 at the University of St. Andrews. Although there have been ups & downs in their relationship in these nine long years, with a brief break-up in 2007, their strong chemistry rekindled their relationship, for good! And then came their wedding on 29th April, an affair to remember. 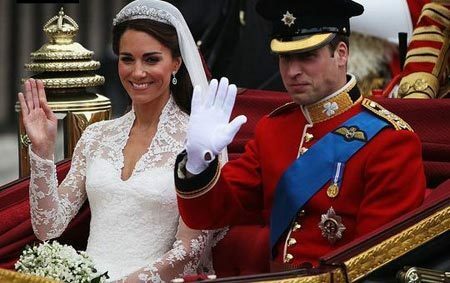 Besides being royal, it was a fairy tale wedding with over two billion people across the globe, watching it live. Elegance personified Prince William, Duke of Cambridge and Catherine Middleton, now the Duchess of Cambridge took vows at Westminster Abbey in London. After the bride shyly said 'I do', the royal couple walked down the aisle and the crowd congratulated them with loud cheers as they went down the road in a vintage cart. Soon the wedding ceremony was sealed with the much awaited moment 'the kiss' on the balcony of the Buckingham Palace! Ah! What a fairy tale wedding it was! But, like in fairy tales, will the Prince & the Princess live happily ever after? Or will history repeat itself? Ganesha takes a peek into the future of the newly-wedded couple, with the help of Vedic astrology. Time of birth:- 21 hours 03 min. Time of birth:- 11 hours 15 min. Kate is a Manglik and William is Non-Manglik. Ganesha feels that both William and Kate's charts are challenging for their conjugal life. 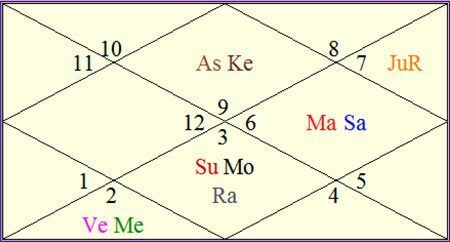 Exalted Rahu's placement with Sun in the 7th House of life partner indicates scope of differences and separation with the life partner. Similarly in Kate's chart, Mars and Saturn's position in the 7th House indicates challenging married life. As Kate's Lord of the 7th House is in the 11th House of fiscal gains, she obviously will have a lot of advancement in her life through this marriage. In Kate's chart Moon and Rahu are placed in Gemini, falling over William's Sun, Rahu and Moon. This also indicates stress in the married life. The most positive point here is, both are born with Moon Sign Gemini, which means that communication is the key. Both will have to use effective communication in order to sort out problems/issues in their married life. William's Sun sign is Cancer and Kate's Sun sign is Capricorn. Though we always say that 'opposites attract', in this case, Ganesha sees possibilities of attraction and distraction both, because one sign is ruled by Saturn and the other one by Moon. 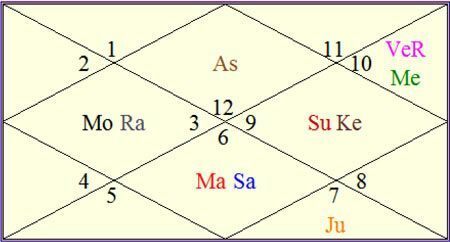 As they got married while there was Stellium of Jupiter, Mars, Mercury, Moon and Venus in Pisces, initial days of married life would be very good; however as the time passes, both may start facing troubles. In short, astrologically both the charts are equally challenging for happy married life so, both of them will have to be extra careful while dealing with each other and as both are born with Moon sign Gemini, will have to avoid arguments in order to live happily. Ganesha wishes good luck to the royal couple.